Delicious, aromatic gum drops with a perfect balance of Propolis, Honey & Eucalyptus to protect and enhance wellness for the mouth and throat. With the antiseptic properties of Propolis combined with the soothing action of Honey, these gum drops can be used by singers, smokers, public speakers and at the first signs of cold weather. It's aromatherapy and apitherapy in a wholesome, natural formula combining their healing powers to treat sore throats! 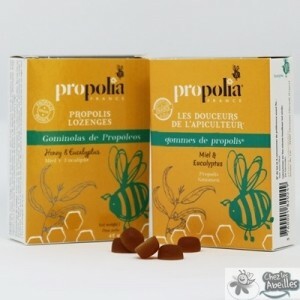 The Propolis, Honey & Eucalyptus Lozenges are ideal to soothe sore throat and freshen the breath. They can be used by singers, smokers or public speakers, and at the first signs of cold weather. The antiseptic properties of Propolis, combined with the soothing action of Honey and Eucalyptus essential oil, make these wellness drops taste like a sweet treat. Gum Arabic (46%), Brown Sugar, Honey (17%), Propolis Extracts (6%), Eucalyptus Essential Oil (0,25%), Mint and Menthol Natural Flavors. Avoid giving to children less than 3 year old. Do not take if allergic to any bee products. Keep in a dry and cool place.